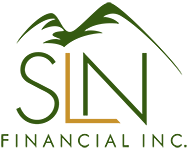 Catch Up on Your Retirement Savings | SLN Financial, Inc.
You aren’t spending down your savings. In fact, you’re probably continuing to save. This can make a big difference – even if you work just a couple more months. We’re here to help you plan for your best retirement. Give us a call and we can assist you in retirement planning and come up with a solidified plan that works for you! *The information contained in this document is for informational purposes only and does not constitute legal or tax advice. One should consult their legal or tax advisor prior to making decisions regarding their Social Security options.